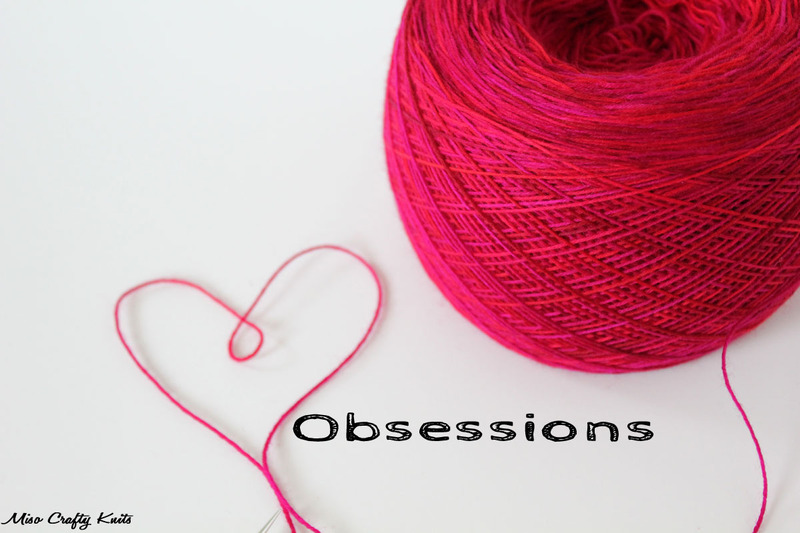 I know, I know...we're already halfway through the first week of September and I'm just posting the August Obsessions now?? Well...I can give you excuse after excuse as to why I'm running behind, and why I've been AWOL here on the blog. But I won't. So let's move on, shall we? August was a mega busy month around here, and I'm not the only one who thought so. Even the Mister couldn't believe that we're already a few days into September. We had agreed that July went by at a decent pace but August, man, August went by faster than you can say "MCN". Yeah I guess you could say I had a lot going on, I was über busy sewing up project bags, I made my vendor debut, and then a day later I went on a week long vacation with the Munchkin that involved a 12-hour drive both ways - solo. Let's just say I haven't done that much driving in years. And yes, I'm sorry that I didn't even utter a peep about taking off. But when you're flying solo with a little one in tow, blogging, tweeting, and yes, even Instagramming really wasn't at the top of my to-do list. I hope you understand! I wish I could say that things will slow down now that we're into September but sadly, it won't. If anything life will be even busier! I'm still in bag production mode as I get ready for Knit City, the Munchkin starts school this month (he actually attended his first day of kindergarten yesterday!! ), this weekend is beer fest, and the next few weeks will involve setting up support networks and a support worker for the Munchkin. Phew! And that's only listing the major things! Don't even get me started on PAC meetings, IEP planning, and researching and putting together a treatment team for the Munchkin. Did I mention the knitting? Yeah, there will be some of that in there too. I've got a few (small) test knits penciled in there somewhere too. Oh yeah, September is going to be a busy month indeed! 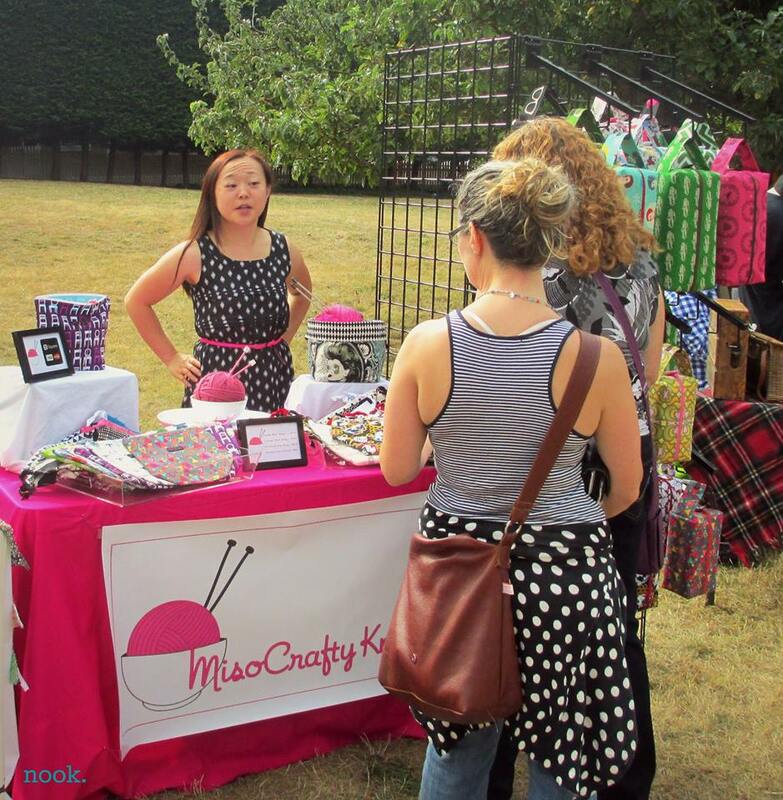 Two weeks ago I made my vendor debut at this year's Fibrations event!! I really wanted to do a separate recap post about Fibrations and all that had happened during the event but I'll be honest here, it's not going to happen. Not only have I been short on time lately to do a proper post, but I also didn't take a single picture. Surprised? I know I am! I had grand plans to Instagram the entire event but then I realized that in order for me to have enough phone juice to power my credit card reader, I had to cut back drastically on phone usage. So sad. The Mister managed to snap a single photo during the booth set up, but other than that I have to rely on the photo-taking prowesses of others for any and all photos that may have me or my booth in it. The above is from my lovely friend and booth buddy, Rebecca of Nook. For more recaps and photos check out Rebecca's blog, Jane Richmond's blog, and Knit Social's Facebook photo album (there's a photo of me in there that has me laughing my head off...that pretty much summed up the entire day!). I've always had a soft spot for tweed and tweedy yarns, but oddly enough I don't have anything in my closet that involves this textured material. I don't know if my brain was ready for fall or what, but for some reason all I wanted to do was make things in tweedy goodness. My stash sadly lacks tweed yarn but I do have a few balls of tweed sock yarn and a few sweater quantities that I've been hoarding saving for when the right time comes along, and what better time to knit them up than now when I'm craving tweed yumminess? Who doesn't love a fluffy pom pom?? Whether it's a giant one affixed to the top of your toque or tiny ones that adorn your socks, pom poms are loved by peeps of all ages. It wasn't until I acquired these atomically awesome Clover pom pom makers that I went into full pom pom producing mode. My plan was to make a pom pom garland for my booth using pink, grey, and black (surprise, surprise!) but then I ran out of time and so it never got made. But don't worry, it will. I also have grand plans to make other kinds of pom pom crafts, but will have to wait until project bag production slows down a bit before I can indulge in these crafty side projects. In the meantime, I'm loving the fact that pom poms are going to be the trendy thing for this fall and winter. So stay tuned for more pom pom action near you!! Whether you're a fan of The Hunger Games trilogy or not, you have to admit that the cowl you see on Jennifer Lawrence's Katniss in the above photo is pretty darn awesome. And after much Google-ing (and ogling!) and a whole lot of scrutinizing of how this cowl is constructed, it turns out that I'm not the only blogger or fibre enthusiast who adores and covets this asymmetrical showstopper. I've stumbled upon handfuls of blogs whose authors are determined to come up with an exact replica or something inspired by it. There's such debate as to whether this piece was crocheted or knitted...or both (FYI: so far the consensus says the cowl part is single crochet over rope or a similar form of tubing). Is the bottom piece shaped with short rows or is it just one long piece? How is it joined in the back? Answer: like a poncho. There aren't many photos of the backside of the cowl floating around on the internet, the above is the only one I can find (and this one has better photo quality than the rest of the lot) and/or is only available until the movie is out (or so I assume). Ahhh...garment construction...this is what keeps me awake at night. Seriously. I wish I had the time right now to tackle this challenge too, but alas, I do not. Who knows though, maybe by the time my schedule lightens up enough, there will already be a pattern waiting? In the meantime, I've seen several renditions of this design already popping up for sale on Etsy. In case you now want your own. yay for the obsessions post!! um that cowl is something amazing! and it's the first I've seen of it! I love it. also, I can't believe I forgot to add a pompom maker to my kp order! gah. Hahaha, thanks Becca! ;) You can always borrow one of my pom pom makers if you need to! Glad you posted. Glad your booth went well. Glad you got a vacation (12 hours! Ugh!). Glad you wrote about this cowl! Beautiful! Thanks Jennifer! ♥ I'm glad I can share the Katniss cowl love! Oohh...I never thought about needlebinding. I must look into that technique! But that could be a black hole and open up something that I don't know if I want to delve into...cause I really don't need something else to take away from knitting! ;) But thanks for the input!! So, so, so excited that you're going to be at Knit City, and now that I've spied you possibly working on Star Wars bags (I suppose you can say that's my September obsession), I'm going to have to be the first in line Saturday morning so I can nab one. Hahaha...you're hilarious Chantel! ♥ I'm hoping to have a bunch of Star Wars and Star Trek bags (in both box and drawstring form) at Knit City!! Sarah, that is NOT too nerdy!! :) My first hope is that the movie would be full of knitwear too! After all, District 12 is set in Appallachia...so it gets cold there...right?? Super excited to see your new post! I know how it is (although you've actually been busy, whereas I...well..yeah). Happy September! Don't forget to enjoy the process! Hahaha, thanks Ashley!! :) Happy September to you too! And I'll remember to try to enjoy the process!! Hi there! 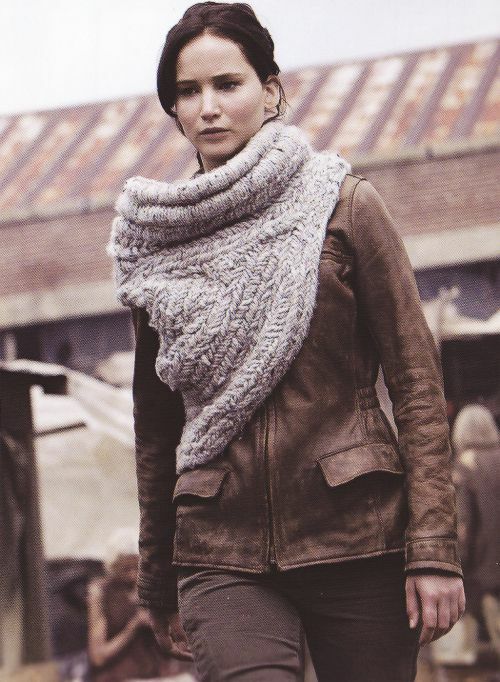 I just thought I'd share my new pattern listing for the Katniss Cowl for you to check out…. I hope you love it… maybe this will make it easier for you to make your own!